by Anderson, Sharon K.; Middleton, Valerie A. Every person comes to know and understand their life from their own perspective. As a result, it is often difficult and sometimes unbelievable to realize that others, whom one may or may not know, might also experience daily life in a vastly different way. 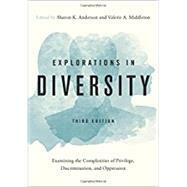 Explorations in Diversity offers readers the opportunity to step into the lives of diverse others and experience their lives through their eyes. Some readers may find themselves struggling to comprehend or even believe the experiences this text's authors share, or where they fit within each narrative. However, each account in this text ultimately aims to open minds, hearts, and mouths in ways that push each of us toward a better understanding of our own privileged statuses so that we can use who we are, what we say, and what we do to make our society more accepting and inclusive of all our diverse representations. Chapter 30: Yes, I See You're Committed to the Cause . . . But Where's Your Credibility, and Why That Angst?